To fit Infant/Toddler sizes 3 (6, 9, 12, 18, 24, 36) months. Directions are for smallest size with larger sizes in parentheses. If only one figure is given, it applies to all sizes. Finished Chest: 20 7/8 (22, 23 5/8, 25 1/4, 26 3/4, 28, 29) in. Back Length: 10 5/8 (11 3/4, 13, 14 1/8, 15, 15 3/4, 16) in. Circular knitting needles each 16 in. long in sizes 0 and 2 U.S. OR SIZE REQUIRED TO OBTAIN GAUGE. Set of double-pointed needles in sizes 0 and 2 U.S.
Steel crochet hook size 6 U.S.
To fit Infant/Toddler sizes: 3 (6-9, 12-18, 24-36 months.) Directions are for smallest size with larger sizes in parentheses. To fit Infant/Toddler sizes: Sizes 3 (6-9, 12-18, 24-36 months.) Directions are for smallest size with larger sizes in parentheses. 32 sts and 40 rnds = 4 in. with Dale of Norway BABY ULL and size 2 ndls in St st. NOTE: TO SAVE TIME, TAKE TIME TO CHECK GAUGE. With smaller circular ndl and Color 1, CO 170 (182, 194, 206, 218, 230, 242) sts. Join and working in-the-rnd purl 2 rnds, then knit 1 rnd. Beg Pat A as shown on chart and work until Body meas 1 1/8 (1 1/8, 1 1/8, 1 5/8, 1 5/8, 1 5/8, 1 5/8) in. from bottom of Pat A. Change to larger circular ndl and place side markers at beg of rnd and after 85 (91, 97, 103, 109, 115, 121) sts. Beg St st and work until Body meas 61/4 (7 1/8, 7 7/8, 8 5/8, 9, 9 1/2, 9 7/8) in. from bottom edge. Divide Body at markers and work Front and Back separately. Shape neck: Working back and forth, cont St st and work until armholes meas 2 3/4 (3 1/8, 3 1/2, 3 1/2, 4, 4 3/8, 4 3/4) in. Next rnd: Work first 37 (40, 42, 45, 48, 50, 53) sts, BO next 11 (11, 13, 13, 13, 15, 15) sts for neck opening, then work to end of rnd. Right shoulder: Cont in St st and BO at neck edge at beg EOR: 3 (4, 4, 4, 4, 4, 5) sts once, 3 sts once, 2 sts twice, then 1 st 1 (1, 1, 2, 3, 3, 3) times – 26 (28, 30, 32, 34, 36, 38) sts. Work even until armhole meas 4 3/8 (4 3/4, 5 1/8, 5 1/2, 5 7/8, 6 1/4, 6 3/4) in. Knit 1 rnd on WS (or Purl 1 rnd on RS). BO. Left shoulder: Join yarn and shape neck same as right shoulder, then work even until armhole meas 4 3/8 (4 3/4, 5 1/8, 5 1/2, 5 7/8, 6 1/4, 6 3/4) in. Knit 1 rnd on WS (or purl 1 rnd on RS) for fold line, work 4 rnds St st for facing. BO. Shape neck: Working back and forth, cont in St st and work until armholes meas 3 3/4 (4 1/8, 4 1/2, 4 7/8, 5 1/4, 5 5/8, 6 1/8) in. Next rnd: Work first 32 (34, 36, 38, 40, 42, 44) sts. BO next 21 (23, 25, 27, 29, 31, 33) sts for neck opening, then work to end of rnd. Right shoulder: Cont in St st and BO at neck edge at beg EOR: 3 sts twice – 26 (28, 30, 32, 34, 36, 38) sts. Work even until armhole meas 4 3/8 (43/4, 51/8, 5 1/2, 5 7/8, 6 1/4, 6 3/4) in. Knit 1 rnd on WS (or purl 1 rnd on RS). BO. Left shoulder: Join yarn and shape neck edge same as right shoulder, then work even until armhole meas 4 3/8 (4 3/4, 5 1/8, 5 1/2, 5 7/8, 6 1/4, 6 3/4) in. Knit 1 rnd on WS (or purl 1 rnd on RS) for fold line, work 4 rnds St st for facing. BO. With smaller dpns and Color 1, CO 44 (46, 48, 50, 52, 54, 56) sts. Join and working in-the-rnd purl 2 rnds, then knit 1 rnd. Beg Pat A as shown on chart and work until Sleeve meas 1 1/8 (1 1/8, 1 1/8, 1 5/8, 1 5/8, 1 5/8, 1 5/8) in. 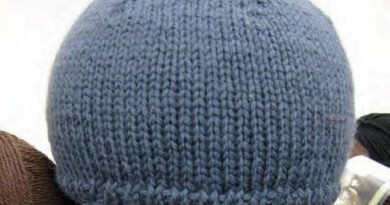 from bottom of Pat A. Knit 1 rnd and inc 4 (4, 4, 6, 6, 6, 6) sts evenly spaced across rnd – 48 (50, 52, 56, 58, 60, 62) sts. Change to larger dpns and St st. Inc 1 st at beg and end of every 4th rnd 12 (14, 15, 15, 18, 19, 20) times, then every 3rd rnd 1 (1, 2, 3, 2, 3, 4) times, leaving 2 sts bet inc sts – 74 (80, 86, 92, 98, 104, 110) sts. Work even until Sleeve meas 6% (71/2, 8 1/4, 9, 9 7/8, 10 5/8, 11 3/8) in. from bottom edge. Purl 1 rnd. BO. Lay Body and Sleeves out to finished measurements and steam lightly. Sew right shoulder. Fold left shoulder facings to inside along fold lines and sew to WS. Sew approx 5/8 -7/8 in. along left shoulder from armhole. Neckband: With RS facing, using smaller circular ndl and Color 1, beg at left front shoulder edge PU 32 sts per 4 in. along neck edge only using crochet hook to PU an odd number of sts knitwise. Working back and forth, beg with a WSR, work 2 3/8 (2 3/8, 2 3/8, 2 3/4, 2 3/4, 2 3/4, 2 3/4) in. of k 1, p 1 rib. BO loosely in rib. Fold neckband to inside along middle of rib and sew loosely to WS. Sew ends of neckband closed. Crochet 3 button loops to left front shoulder edge and end of neckband, centering one loop on end of neckband, then evenly space rem loops along shoulder. Sew buttons to back edge of left shoulder under button loops. Pin Sleeves into armholes, placing centers of Sleeves at shoulder seams, then sew Sleeves to Body. With smaller circular ndl and Color 1, CO 29 (29, 29, 31, 31, 33, 35) sts. Working back and forth, beg Pat A and work until pocket meas 2 3/4 (2 3/4, 3, 3, 3 1/8, 3 1/8, 3 3/8) in. BO. 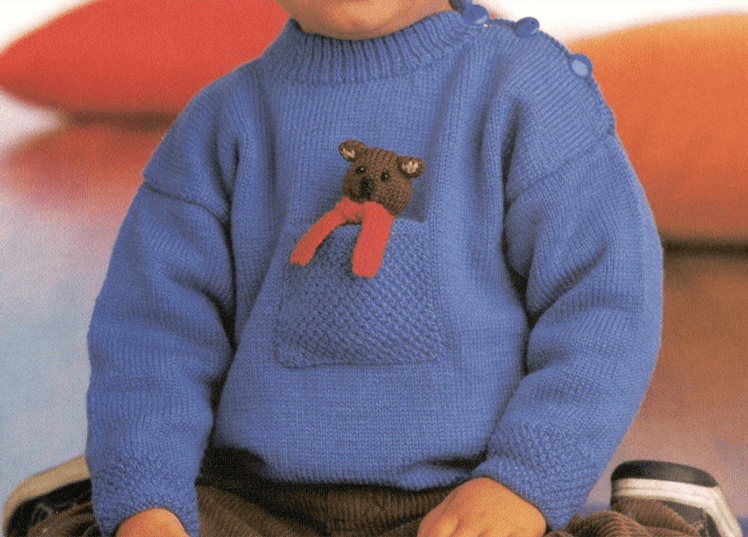 (If desired, embroider Teddy Bear to center of front, placing top of ears 1 1/8 (1 1/8, 1 5/8, 1 5/8, 2, 2, 2 3/8) in. below neckline. 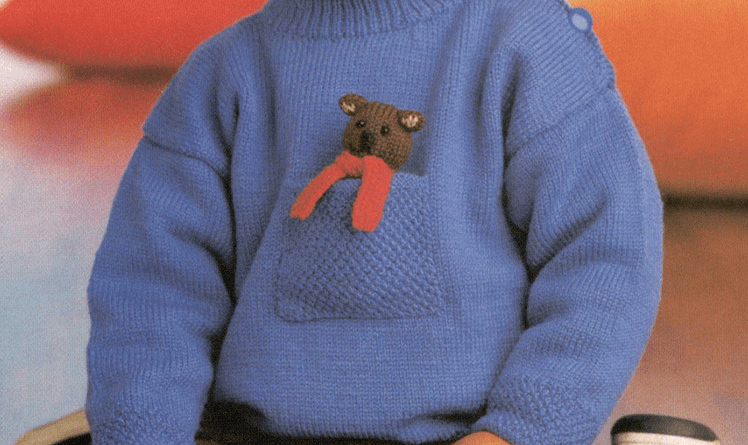 Pin pocket to front, with CO edge at top of pocket, centering pocket just below embroidered bear as shown, or placing pocket 3 3/4 (3%, 41/8, 41/8, 41/2, 4’/2, 4 7/8) in. below neckline. Sew pocket to front along sides and bottom edges. With smaller dpns or circular ndl and Color 1, CO 112 (120, 128, 136) sts. 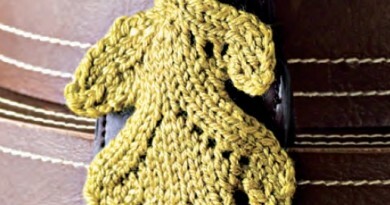 Join,and working in-the-rnd beg rnds at center of back and purl 2 rnds, then knit 1 rnd. Beg Pat A and work until Cap meas 1 1/8 (1 5/8, 1 5/8, 1 5/8) in. from bottom of Pat A. Change to larger dpns or circular ndl. Beg St st and work until Cap meas 5 7/8 (6 3/4, 7 1/2, 8 1/4) in. from bottom edge. Work 1 picot rnd (*yo, k2tog; rep from * to end of rnd). Purl 1 rnd. BO. Ear flaps: With larger dpns or circular ndl and Color 1, CO 29 (31, 33, 35) sts. Working back and forth, beg Pat B as shown on chart and work until ear flap meas 1 1/8 (1 1/8, 1 3/8, 1 3/8) in. from center of back. Sew ear flaps to Cap. Make 2 twisted cords long enough to tie under chin with Colors 1, 3 and 4 held tog. Securely attach 1 cord to lower end of each ear flap. Make another twisted cord with Colors 1, 3 and 4, 15 3/4 (17, 17 3/4, 18 7/8) in. long. Thread cord through Picot rnd at top of cap, then pull cord to gather cap. Tie ends to secure. Make 4 small pom poms with Colors 1, 3 and 4. Attach 1 pom pom to free ends of all 3 cords. With smaller dpns and Color 1, CO 40 (44, 48, 52) sts. Join and working in-the-rnd work 3’/8 (3 1/8, 3%, 3%) in. in k 1, p 1 rib. Work picot rnd (*yo, k2tog; rep from * to end of rnd). Change to larger dpns and place markers at beg of rnd and after 20 (22, 24, 26) sts. Beg Pat A as shown on chart and work until hand meas 7/8 (1, 1 1/8, 1 3/8) in. above rib. Next rnd: Work as est to last 5 (6, 7, 8) sts of rnd, work these sts with a piece of scrap yarn for thumb opening, sl these sts back to LH ndl and work with Color 1 as set to end of rnd. Cont working until hand meas 2 3/8 (2 3/4, 3 1/8, 3 1/2) in., or approx 7/8 (7/8, 7/8, 1) in. less than desired length from top of rib. Shaping: Beg dec 1 st each side of both markers every rnd 8 (9, 10, 11) times, keeping to pat as est and working decs as k2tog tbl before markers, k2tog after markers, or p2tog. Gather rem 8 sts on a piece of yarn and fasten securely. Thumb: Remove scrap yarn and sl resulting 10 (12, 14, 16) loops to larger dpns and PU 1 st on each end of opening -12 (14, 16, 18) sts. Join and working in-the-rnd change to Color 2. Cont Pat A as est and work until thumb meas 1 (1 1/8, 1 3/8, 1 5/8) in. or desired length. K2tog across next rnd. Gather rem 6 (7, 8, 9) sts on a piece of yarn and fasten securely. Work to match Left Mitten, placing thumb opening at beg of rnd. Make 2 twisted cords of desired length with Colors 1, 3 and 4 held tog. Thread one cord through picot rnd of each mitten, beg and end at center back of hand. Make 4 small pom poms with Colors 1, 3 and 4. Attach one pom pom to each end of both cords. With larger dpns or circular ndl and Color 1, CO 30 sts. Working back and forth, beg St st and work until piece meas approx 4 3/8 in. from bottom edge. BO. Sew side edges tog. Lay tube with seam at center of back and sew top end. Work 3 sts of duplicate st embroidery with Color 3 for inner part of each ear. Tightly wind a piece of Color 1 around each top corner of body for ears. Fasten off. Lightly stuff body of bear with fiber fill. Sew lower edge of body closed. Tightly wind a piece of yarn around body approx 1 3/8 in. from top edge (Option: Baste around body at this point with a piece of Color 1. Gather yarn tightly, then fasten securely.) Sew buttons to front of head or, if desired, work large French knots with Color 4 for eyes. Embroider mouth and nose as shown.